Member of the American Academy of Actuaries. A form of professional liability insurance covering the practitioner against liability suits, whether such action has merit or not, and the payment of court awarded damages up to the limits of the policy on behalf of the insured. A general term that refers to an organized system of health care delivery in which the health care providers are affiliated with a health plan in such a way as to provide participants with quality, cost-effective care. An individual that is responsible for appointing personal producing general agents (PPGA) on the behalf of one or more insurance companies. Health insurance benefits that are required by state law to be included in a policy. A liability account established by the National Association of Insurance Commissioners (NAIC) for valuing stocks and bonds for reserving purposes. The objective of this reserve is to minimize changes to surplus due to market fluctuations through incremental increases in the MSVR as capital gains are realized during the year. The group insurance rates that are established by the insurance company for groups that do not have a credible loss experience. These rates may also be used to establish the initial premium rates for a large group. A type of brokerage account that allows the owner or customer to purchase certain securities by borrowing a portion of the price from the brokerage firm. A provision of the Federal Tax Code that provides an unlimited deduction from Federal Estate Taxes to qualified transfers of property between a husband and wife. This in effect can shift the estate tax burden to the last spouse's death. Also see estate planning. The time period, during which the economy expands, contracts and expands again. This time period is generally 3 to 5 years. A form of investment risk that all investments in the same class (e.g., stocks or bonds) will decrease in value. A single policy issued on a group basis to an employer. Group members receive certificates stipulating benefits provided. Refers to the dates on which the principal of a bond must be repaid by the bond's issuer. A provision in health insurance policies that sets the most that you are eligible to receive in benefits from the health plan during your lifetime. This health insurance program was enacted in 1965 as part of the Social Security Act. It is a joint Federal-state program providing medical assistance to the aged, blind and disabled, and families with dependent children who cannot afford such assistance. This health insurance program was enacted in 1965 as part of the Social Security Act. Medicare provides medical benefits to individuals age 65 and over, and persons under 65 who are disabled and have received Social Security disability benefits for 24 consecutive months. The program has two parts--Part A, Hospital Insurance, and Part B, Supplementary Health Insurance. In the underwriting process for life and health insurance, an examination by a physician may be required. The physician is selected by the insurance company and performs the tests that are based on the size of the policy, and the age and health of the proposed insured. An organization established to guard against fraud by applicants for life and health insurance. MIB maintains the health history on computer for individuals applying for coverage with member companies. Also see MIB Home Page. An international organization of life insurance agents formed in 1927. Membership is obtained by meeting both life insurance production requirements predetermined each year by the MDRT. Membership in the organization is recognized as the standard of excellence in life insurance sales performance. Also see MDRT Home Page. A type of trust that provides asset management until a child reaches the age of maturity. At this time the child has full control and use of the assets. Through the use of this type of trust, the grantor has controll over the time at which the minor has access to the assets. A complex investment program, that permits the investor to estimate, control and classify the types of risks and the amount of, expected risk and return they may expect. This process involves securities valuation, asset allocation, portfolio optimization and performance measurement with respect to the relationship of risk and return for the investments being considered. A form of reinsurance that is similar to coinsurance with the exception that the reinsurer does not hold the reserves on the policy. A mutual fund that invests in short-term investments. These funds are generally sold as no-load funds and may offer check writing privileges. A defined contribution retirement plan requiring fixed or specified contributions usually based on an employee's salary. Tables constructed by insurance companies and others that provide the probability of illness at a certain age. These tables can have a high degree of accuracy when used for a large number of people. The tables are not very useful to determine if a given individual will become ill. Tables constructed by insurance companies and others that provide the probability of death at a certain age. These tables can have a high degree of accuracy when used for a large number of people. A security backed by mortgages issued by the Federal Home Loan Mortgage Corporation and the Federal National Mortgage Association. Investors in mortgage-backed certificates receive payments derived from the interest and principal repayment of the underlying mortgages. A trust that is established to provide group insurance or pension benefits to the employees of several small employers, often in the same industry. By banning together, the employers are able to obtain the coverage at a lower cost then if they applied separately. A type of bond or debt obligation issued by state or local governments to fund general municipal needs or special projects. 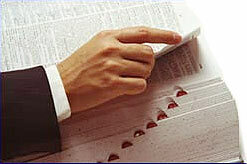 A category of mutual fund investment comprising bonds of state and local governments. These funds may vary by maturity, geographical distribution and rates of return. Coverage written by private insurers that guarantees bondholders against default by municipalities. This type of insurance can be purchased by either the issuing entity or by the investor, and provides that in the event of default bonds will be purchased from the investor at par value. The fund pools the resources of investors by selling its shares to the public and investing the proceeds of such sale in a portfolio of securities designed to achieve the fund's investment objective. All of the owners in the fund shares participate in the gains or losses of the fund. These investments can only be sold by registered representatives. Mutual funds are also known as an open-end diversified management investment company. An insurance company that is owned by its policy owners. Also see stock insurance company and mutualization. The process where a stock insurance company buys back or retires shares of the company and changes to a mutual insurance company .